"Gooey, green goodness! You can go large and do monster-sized russets, adapt them into a potato skin-style serving, or make an elegant presentation with fingerlings." Preheat oven to 350 degrees F (175 degrees C). Pierce the potatoes in a couple of places with a sharp knife; place on a baking sheet. Bake in the preheated oven until a knife easily slices through the potato, 45 to 60 minutes. Cool potatoes for 10 minutes. Slice potatoes horizontally; scoop out the flesh with a fork, leaving the skin intact. 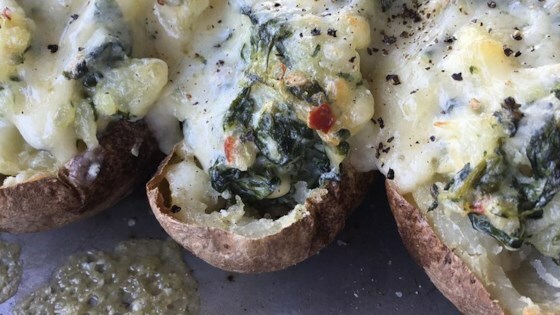 Mix potato flesh with spinach artichoke dip in a bowl; spoon back into the potato skins and top with Cheddar cheese. Bake in the oven until cheese is beginning to melt, 15 to 20 minutes. Turn on oven's broiler and broil until cheese begin to bubble and brown, 2 to 5 minutes. Serious comfort food that delivers all the warm, gooey, cheesy, savory goodness you could possibly handle. I want to eat another one right now. I made this with fingerling potatoes and people loved em! You can also microwave the potatoes first to speed up the process. I may add jalapeños or green onions in the mix next time. These are incredible! I want to eat them every day. I'm thinking about experimenting with the cheese, maybe adding goat cheese into the mix! Yes, I made it and will definitely make it again. I used Tostitos Creamy Spinach dip instead of Spinach-Artichoke dip and it was so easy to make and tasted great. Yummy! I added red crushed pepper too!